More wood on the way! Thank you for your continued friendship and patronage! ** This is a slab in exactly the size range that we like to collect for ourselves. It has growth rings that we like to say you can see from across the room. The rays, shape, and color of this piece give it real "presence" - a specimen that immediately draws the eye to it. We want to point out that this log actually split into three long pieces when it came out of the hole. The diggers very carefully packed the individual pieces so there would be no damage when the log was reassembled. Then, the log was reassembled, cut, and professionally polished by our lapidary in Southern California, and they are one of the best in the country! Repairs done carefully and correctly are not readily noticeable, and you will be hard-pressed to find it on this slab. But we are always straightforward about whether we believe a slab has been repaired. The Stinking Water petrified wood has a really interesting geologic history. The host rock is hyaloclastite with intermixed basalt pillows and capped by a basalt flow above the wood layer. Hyaloclastite forms when basalt lava flows into a body of water and rapidly cools, fragmenting into glassy bits. The interpretation of this hosting rock type is that the trees, which are preserved in upright growth position, were submerged before lava covered the area. The most likely explanation is that the basalt flow dammed a river, flooding the surrounding woodland. This shielded the trees, enabling their survival of volcanism without being incinerated. The capping basalt created an anaerobic environment for the wood, preventing decay by fungus, bacteria, or insects. The trees, now entombed in rock, slowly were replaced by silica from the surrounding rock with such detail that the cellular structure is intact. The Stinking Water locality was previously thought to be Pliocene in age, but recent dating by the 40Argon/39Argon has determined it is actually older (Miocene) at 13.79 Million years. This slab has the remarkable Stinking Water color scheme - tan in the center, golden brown at the outer circumference, and black dividing the two colors and framing the entire slab on the periphery. We love these classic pieces! ** One of the more interesting and colorful slab of palm roots one could hope to have in your collection! Yermo is only a couple of miles from the Mule Canyon palm root locality and the two sites were likely desert oases at roughly the same time. However, my opinion has been that they might have been subjected to different volcanic events at different times (perhaps separated by dozens or hundreds of years) because the vibrant red/orange colors that appear in the Yermo specimens are different from the more muted colors of Mule Canyon. Of course, this is simply speculation on my part ... but what an intricate colorful pattern of roots artistically outlined in this nice piece! We don't see Yermo palm on the market very often, that is for sure. ** We don’t see a lot of wood from Tom Miner Basin these days, so we acquire them whenever we see them. Only pieces from old collections (like this one) seem to come to market any longer. The Basin is quite high in elevation and it is a very difficult hike to get into the wood-bearing localities. Lower elevation specimens have largely disappeared except for those on a nature trail (and those are NOT available for collecting). We particularly like the great pattern, the vugs containing nice bubbly chalcedony, and the way this specimen sits on its natural end for effective display. And by the way, we've included a view of that natural, unpolished end cut side of this piece. We think it is every bit as beautiful as the polished side with the bubbly chalcedony seen in relief. Click the close-up views! ** Well, those of you that know us also know that we are not prone to superlatives, but this limb of "candle wood" is a king of aesthetics. It was imported several years ago and given a trade name of "Candle Wood" because of the beautiful sky blue, waxy luster, and sometimes bubbly chalcedony that has infiltrated and precipitated into the cracks in the wood creating a beautiful display specimen. While we don't normally like to use trade names given to specimens by enterprising dealers, so many collectors recognize the name candle wood that we too are using it. In fact, it is a quite-black, broadleaf evergreen tropical hardwood with gorgeous blue chalcedony. We have seen some of the wood cut and polished but have always thought that the all-natural specimens are the finest to appreciate. Thus, we have added only all natural specimens of this unique material to our own collection and suggest that you consider doing the same. ** Well, we simply love all the wood -- including the weird and wild pieces. This one certainly qualifies as weird and wild. This log was definitely dead and down and being attacked by weather, fungus, and any other wood destroying process. We can determine that it was an angiosperm dicot - see our photomicrograph showing the little vessels. But, the preservation has been compromised and there is not enough of a large patch left to make any determination other than "not a conifer." Of course, the Latin Incertae sedis translates into "we simply cannot determine taxonomic affinity" (who knew that Latin could simplify things so well??) The odd thing about this specimen is that the path of destruction seemed to be somehow restricted to the medullary rays and it must have happened rather quickly since it spread all the way to the center before having an opportunity to move laterally away from the rays themselves. A really odd circumstance! The result is this brecciated effect which isolates individual strands of wood in between corridors now filled with chalcedony. The natural side of this end cut (photo top right) is pretty interesting as well. If you collect the weird and the wild specimens, as we do, this one will demand a place in your collection! ** Once upon a time, we had some Black Locust slices from this locality and speculated that it might have been a single tree locality. Now we know that there were more since this is a conifer from the same place. Ironside is really just a wide spot in the road between Brogan and Cow Valley, Oregon. All of the collecting sites in this area were likely single trees in the alternating and overlapping flows of Andesite, Basalt, along with an occasional rhyolite towards the top of the strata column. It has not been named as a specific formation but it is identified as a separate lithologic unit on the USGS National Geologic Map Database. 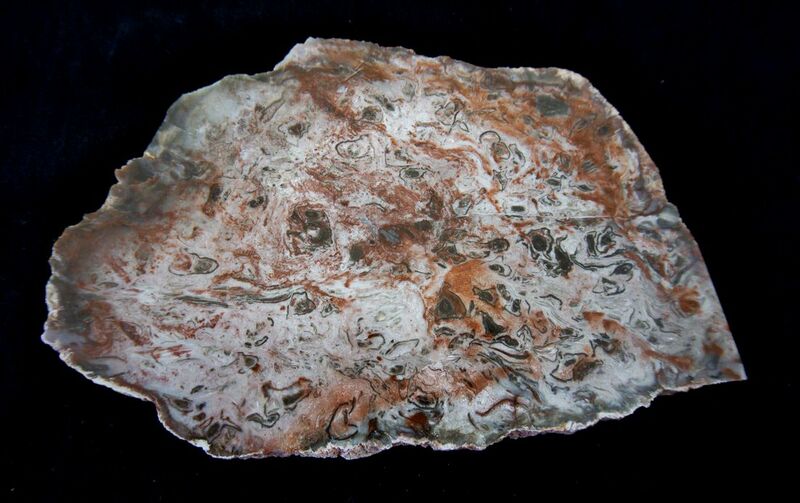 Charming small slab with nicely patterned rot pockets -- from an Interesting locality. Be sure to click for the close-up!